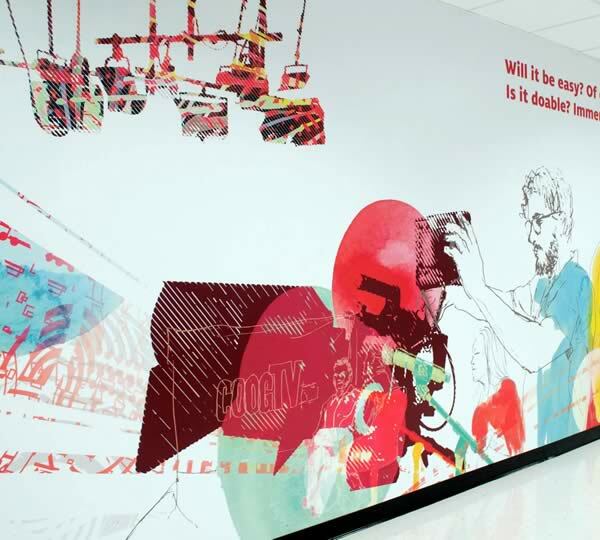 The University of Houston’s College of Arts’ (CotA) School of Art Graphic Design program recently partnered with the Jack J. Valenti School of Communication to create large-scale environmental graphic installations. Associate Professor of Graphic Design Fiona McGettigan and Director of the Valenti School Dr. Temple Northup led the interdisciplinary collaboration and selected three student proposals for installation. 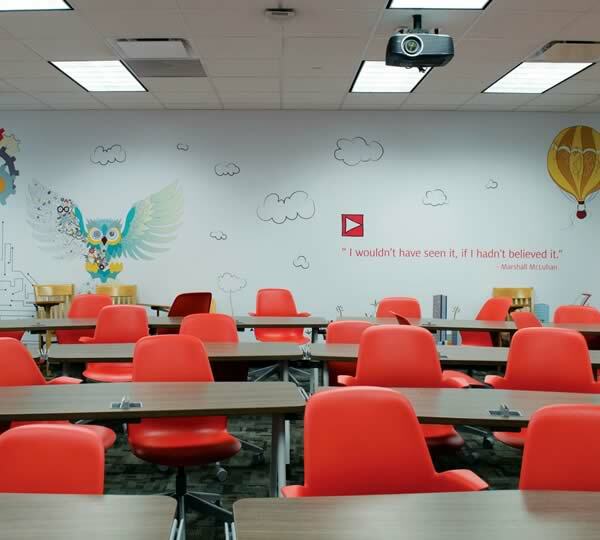 The final installations illustrate the school’s mission to educate compelling, technically-savvy communicators and incorporate details from Jack J. Valenti’s rich personal history. Valenti graduated from UH in 1946 before going on to become the first UH alumnus to receive an MBA from Harvard in 1948. His professional career took him throughout the United States and into influential positions in film and advertising, including working on the Kennedy-Johnson presidential campaign ticket in 1960. The Jack J. Valenti School of Communication was established in his honor in 1978, and has grown to offer a variety of concentrations including Advertising, Film Studies, Journalism, Public Relations, and more. “We wanted to celebrate the Valenti School’s namesake, its students, and its mission to train the next generation of innovative storytellers,” said Dr. Northup. “The Graphic Design students perfectly captured what we are trying to do here." 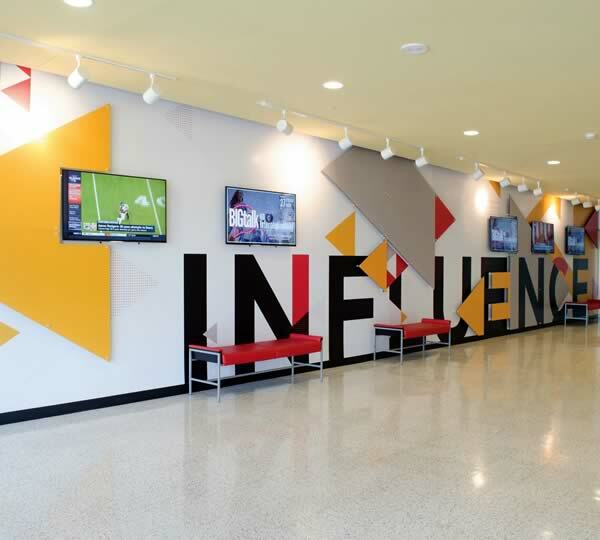 Matthew Oakes’ (BFA 2016) concept, titled “Influence,” was installed in the entryway across from the administration offices, welcoming visitors and students to the school. Typography is central to his three-dimensional design which features bold colors and geometric forms that animate the space. “I wanted to create a design that would be a reminder to students of the potential of their influence,” he said. As visitors venture through the halls of the Valenti School, they will find another installation in the media arts hallway called “Compelling Exchange.” The illustrative design, created by Tracy Ngo (BFA 2016) and Yoko Kristiansen (BFA 2016), uses digital photography, watercolor, and typography to depict students working with professional-grade media production equipment, such as video cameras and audio recording tools. “The Valenti School is rich with individuals who compel others…[and] inspire others to create their own narratives,” Ngo and Kristiansen said, adding that they wanted to showcase the students’ exchange of human experiences using both digital and analogue methods. The third and final installation, “The Pursuit of the Extraordinary,” can be found on an interior classroom wall. Inspired by storytelling and imagination, designer Raafia Jessa (BFA 2016) said she wanted to visually represent the two halves of a human mind. To do so, she combined artistic and analytical elements in her design. “Communication brings together both the logical and the creative sides of one’s mind, using art and language to create a shared symbolic cognition,” she said.